Service quality is where quality management practices and procedures are applied to service industries. Almost two-thirds of modern economies are driven by various service industries and any business with high service quality will meet customer needs while remaining economically competitive. 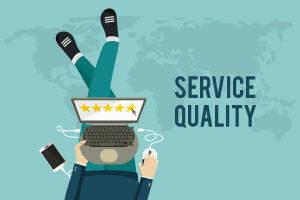 This course will introduce you to service quality and show you how it can be applied within service industries to boost your customers' satisfaction. This course will first introduce you to different service industries such as health care, hospitality, and finance. You will look into the evolution of the QA methods such as the Design of Experiment (DOE), Quality Management Systems, and Six Sigma. You will then study the implications of the perishability of service and the moments of truth in service. You will learn that a dissatisfied customer can become a loyal customer through service recovery. You will then learn the criteria for customer acceptance as well as the five dimensions of service quality. You will look into the Tangibility Spectrum where you will learn the intangible sources of satisfaction. You will also study the Kano model and learn that raising the quality of service by design is the best approach to customer satisfaction. The course will also discuss the classification of service failures with Poka-Yoke Opportunities. The quality of an organization's service is critical to its survival and profitability. This course will teach you effective service strategies that you can apply to your organization. If you have finished studying the Introduction to Quality Management as well as the Fundamentals of Quality Standards, this course will complement what you have already learned perfectly, so make sure to check out the course and keep your professional development moving forward! Define what Service Quality is. List examples of service industries. Define the dimensions of service quality (reliability and responsiveness). Describe what is meant by customer satisfaction. Explain what the service quality gap means.